Del 12 al 16 de junio del 2017, el Centro de Estudios Avanzados de Blanes acoge The IBIS-2017 Conference. 1) Biological and molecular processes involved in the production of biogenic silica. 2) Ecological and biogeochemical mechanisms behind silica fluxes and stocks in continental and marine ecosystems, including paleo-ecosystems. 3) Stable and radioactive isotopes for tracing and quantifying production, accumulation and recycling pathways of silicon and silica in both modern and ancestral environments of continental and marine systems. 4) Biotechnology of biosilicas and their isotopes. 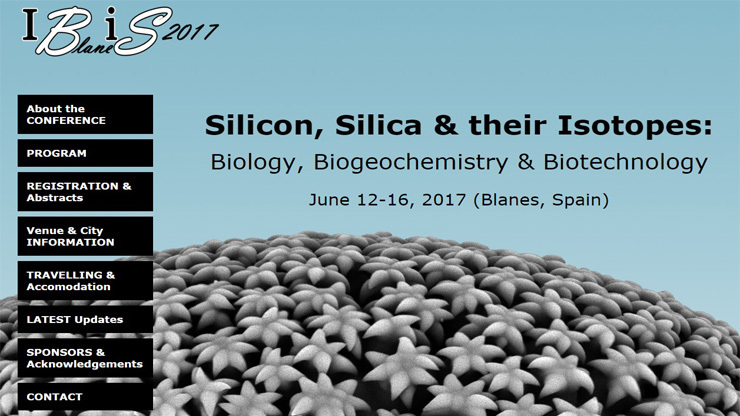 The final objective of the IBIS-2017 is bringing together researchers from very different disciplines who share a common interest (silicon, biogenic silica and/or their isotopes) to promote the collaborative synergistic approaches demanded by the challenges of multidisciplinary cutting-edge research.